Star Wars: Forces of Destiny has proven to be a real (bite-size) treat for fans. Beginning last Monday, a new episode of the animated show has been released daily, each one focusing on a heroine of the Star Wars universe. First, Daisy Ridley returned as Rey from The Force Awakens, alongside BB-8, in episodes one and two. Then Princess Leia saved some Ewoks in episode three, while episode four saw Ahsoka Tano make a comeback, alongside Anakin Skywalker and Yoda. Leia returned for episode five, with Ahsoka taking the reins again for episode six. This installment also saw her team-up with the prequel trilogy’s Padme Amidala. To mark the series’ debut on the Disney Channel, two new episodes arrived yesterday. The first introduces another character new to the series – and only her second on-screen appearance to boot. Titled “The Stranger,” it sees Felicity Jones reprise her role as Jyn Erso from last year’s Rogue One. Perhaps because of the more child-orientated nature of these shorts, she seems a whole lot chirpier this time around. The second, titled “Bounty of Trouble,” features Leia (once again voiced by Shelby Young, replacing the late Carrie Fisher) working undercover within the Empire. She also teams up with another lady from Star Wars lore – Sabine Wren from the Rebels animated series. Plus, there’s a cameo from bounter hunter IG-88! Of these two, the latter is probably the stronger installment. Though the first features Jyn’s return, the story is very slight and plays very closely to the formula the series has already built up – kickass woman saves cute little critter from bad guys. “Bounty of Trouble,” meanwhile, features two heroines for the price of one and fits within the original trilogy. 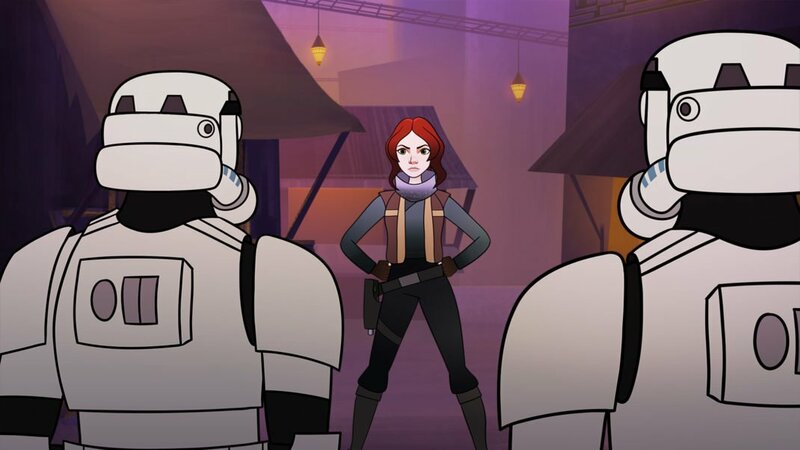 The 16 part microseries has seven episodes left to debut and we look forward to seeing what other cameos and connections Star Wars: Forces of Destiny has in store for us.